Published Jul 22, 2015 by Addison-Wesley Professional. Part of the LiveLessons series. 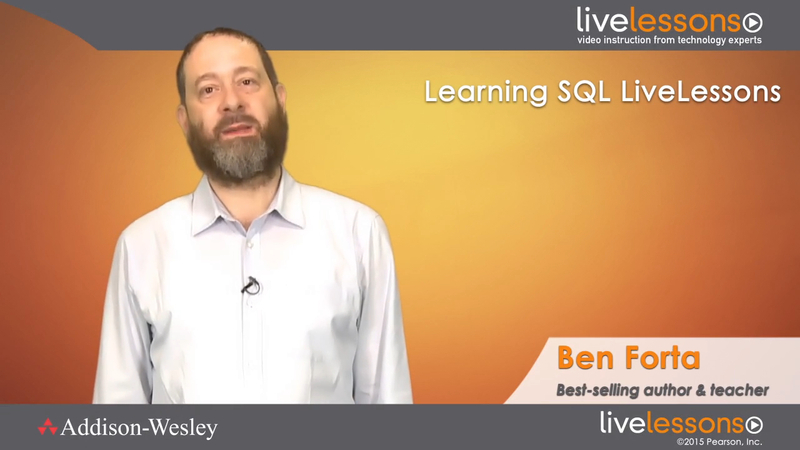 In Learning SQL LiveLessons bestselling author Ben Forta teaches you the basic skills you need to succeed with SQL. Drawing on his experience helping thousands of developers and other IT pros at all levels, Forta guides you, one-on-one, from the absolute basics all the way to queries, joins, and beyond. One step at a time, you'll learn how to retrieve data with SELECT; sort, filter, group, and summarize data; create calculated fields; manipulate data with string and date functions; build queries and subqueries; create basic and advanced table joins; combine queries with UNION; sort your queries; insert, update, and delete data; and even discover what you can do with triggers and stored procedures. Based on Forta's bestselling book, Sams Teach Yourself SQL in 10 Minutes, everything's organized into bite-sized, self-contained lessons, so you can learn key SQL skills quickly and easily. Review database basics such as tables, rows, columns, and keys; understand what relational databases are; choose a DBMS; and learn what SQL is and what it does. Work with SELECT, the most used SQL statement. Retrieve individual, multiple, or all columns; retrieve specific rows; and limit the data you retrieve. Master and refine some important SQL skills and best practices. Use SELECT ORDER BY, sort by one or multiple columns, and specify the direction of your sort. Use SELECT WHERE and its clause operators, use BETWEEN to filter for a range of values, and use NULL to filter for no value. Combine WHERE filters using AND and OR; correctly manage “order of evaluation”; use IN to filter by a defined set of matches; and negate clauses with NOT. Create wildcard filters with the LIKE keyword, and learn three wildcards you can use to search for any character combinations. Use concatenation and aliases, and perform on-the-fly mathematical calculations using calculate fields and mathematical operators. Manipulate data with string and date functions. Use the aggregate functions AVG, COUNT, MAX, MIN, and SUM to summarize data, totals, averages, and more. Group data with the GROUP BY clause, and use the HAVING clause to filter by group rather than row. Create powerful subqueries (queries passed to other queries) to filter rows in conjunction with WHERE and to return values to calculated fields. Master and compare two ways to create simple joins with keys. Then, learn how to join multiple tables. Use table aliases, self-joins, and outer joins, and combine joins with aggregate functions. Use UNION to combine query result sets from multiple SELECT statements, include or exclude duplicate rows, and use ORDER BY to sort the queries you’ve combined. Insert rows or retrieved data, avoid unsafe ways to use the INSERT statement, master best practices to prevent accidental data changes or deletion, and copy data to another table. Update and delete table rows. Master UPDATE and DELETE best practices to make sure you don’t inadvertently change or delete data that should remain intact. Discover what can be done with advanced features such as views, stored procedures, triggers, constraints, and transactions.